Cowboys Stadium starting to resemble NorthPark Center? Victoria's Secret's new PINK store at Cowboys Stadium in Arlington features the limited-edition PINK NFL Collection, most of which is expected to promote the NFL's most valuable team. While the Victoria's Secret line isn't new to the NFL, Cowboys, or even the Texas Rangers (who have their own PINK line), the company said it's the first time they have opened a store inside a professional sports venue. A ribbon-cutting ceremony was held Monday, just hours before the Cowboys hosted the Chicago Bears. Victoria's Secret models Elsa Hosk and Jessica Hart were on hand, along with Dallas Cowboys executive vice president of brand management, Charlotte Jones Anderson. The group unveiled the line of co-branded women's items including tees, sweats, hoodies, tank tops, underwear and sports bras. Ladies, you don't have to go to the stadium to get your gear, however. 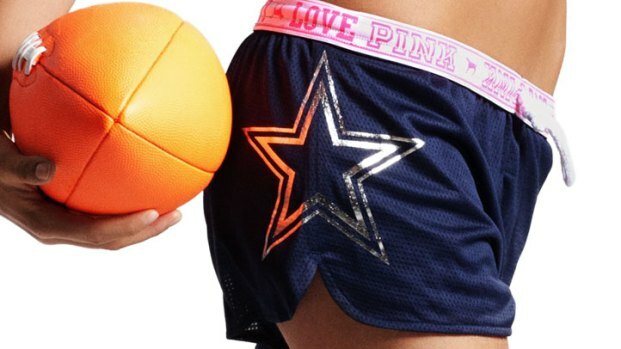 The limited edition Cowboys Collection items will also be available in Victoria's Secret stores throughout North Texas and online at victoriassecret.com/pink/dallas-cowboys. Forbes magazine this month named the Dallas Cowboys the NFL's most valuable team for the sixth consecutive year, worth more than $2 billion. Supermodel Chanel Iman talks about the Victoria's Secret PINK MLB line featuring the Texas Rangers.